KALAMAZOO, Mich., Jan. 19 (SEND2PRESS NEWSWIRE) — Griffin Pest Solutions has won a Bed Bugsy Award from the National Pest Management Association (NPMA) for its educational direct mail bed bug campaign. The NPMA created the Bed Bugsy Awards to recognize creative excellence in the marketing and advertising of bed bug services executed by pest control companies across the nation. 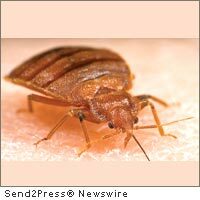 Winners were announced at the recent National Bed Bug Forum in Denver, Colorado. Griffin Pest Solutions has been sending the posters to federal, state and local agencies as well as places where bed bugs are commonly found such as apartment communities, hotels, colleges and universities, assisted living facilities, shelters and hospitals. “It is our hope that the posters will be hung where staff or residents can see them so they know what bed bugs look like and where they hide,” Griffin explained. To receive a free educational bed bug poster, or to have Griffin Pest Solutions speak to your group or organization, contact Denise DeVries at 888-547-4334 or denise@GriffinPest.com . 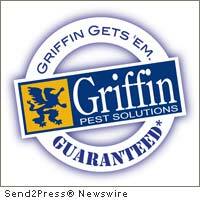 Griffin Pest Solutions, Inc. (www.GriffinPest.com) services Northern Indiana and Michigan. They are certified Bed Bug FREE as well as GreenPro and QualityPro certified by the National Pest Management Association. Since 1929, the company has been locally owned and operated by the Griffin family with offices in Kalamazoo, Grand Rapids, Battle Creek and Ann Arbor. Image Caption: Bed bug feeding on a human arm. Credit: Gary Alpert, Harvard University, Bugwood.org . Original Keywords: bed bugs, bed bug services, pest control, seminar, treatment options, npma, bed bugsy award, marketing campaign, michigan, pests control, bedbugs, remove, find, locate, test, home, house, beds, bedding, bedclothes, floors, drapes, couch, griffin pest solutions inc, linden griffin Griffin Pest Solutions Kalamazoo Michigan KALAMAZOO, Mich.
Alternate Headline: Bed Bug Awareness Marketing Award won by Griffin Pest Solutions, Inc.
REFERENCES: Awards and Honors News, bed bugs, bed bug services, pest control, seminar, treatment options, npma, bed bugsy award, marketing campaign, michigan, pests control, bedbugs, remove, find, locate, test, home, house, beds, bedding, bedclothes, floors, drapes, couch, griffin pest solutions inc, linden griffin Griffin Pest Solutions Kalamazoo Michigan KALAMAZOO, Mich.